Brad Davis (left) and Rod Cook (right) work with student Gary Sharp on proper technique to avoid injury. Golfers needn’t fear the orange whip propped in a corner of the golf-fitness clinic at the Four Seasons Resort and Club Dallas at Las Colinas. It’s not to punish players with bad habits, but rather to help fix out-of-whack sequencing in their swings. 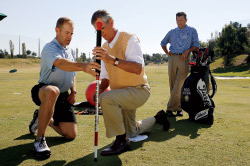 And it’s just one of the tools instructors Rod Cook and Brad Davis use to boost not only the skills but also the long-term health and wellness of golfers seeking more enjoyment from their game. Having each attained Level 3 certification from the Titleist Performance Institute (TPI), the two are in the forefront of a growing golf-fitness movement aimed at improving balance, flexibility, strength, and endurance, particularly as golfers age. “Biomechanics” is the buzzword, but it’s really about physical conditioning and preventive maintenance — making sure bodies work as efficiently as possible to reduce the likelihood of injury and/or pain in a sport where the average male golfer swings at 90 mph and the average female golfer, 65. With even Tiger Woods (and his 125 mph swing) recently sidelined by injury, it’s not surprising that fitness training is gaining momentum as the Holy Grail for golfers seeking to play better over a longer period of time. Identifying those deficiencies — everything from problems with range of motion and core stabilization to hip restrictions and pelvis tilt — is the focus of the Four Seasons golf-fitness clinic, now entering its fourth year. It combines Davis’ comprehensive golf-fitness evaluation, including 12 range-of-motion tests for mobility and stability, with a golf-swing assessment conducted by Cook. During a two-hour assessment at Las Colinas, golfers watch a video comparing their swing with that of a PGA touring pro and get an 18-session custom-fitness plan that they can access online anytime through the TPI Web site. The site, which features demonstrations of exercises, also contains a list of TPI-certified golf pros, fitness instructors, and medical practitioners in Michigan who provide similar analyses, though none boasts the same kind of one-stop service as the Texas resort. Yet, she says, research shows that many golfers report lower back pain, and nearly one in three can’t finish an 18-hole round due to pain. Tait attributes high pain rates to casual players who dash from the office to the first tee, take a few swings, and consider themselves ready to play. “An exercise program — 10 to 25 minutes three to five times a week — can make a world of difference,” she says. At the very least, she advises, warming up is crucial, even if it’s just walking for five minutes at any pace before hitting the driving range or fairways. 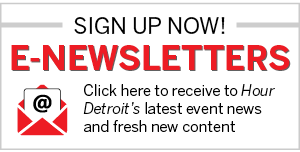 Jennifer Gray, founder of Body Beautiful Boot Camps in metro Detroit, advises golfers to focus on their core strength with an emphasis on balance and flexibility. She recommends yoga as well as working with a Bosu ball, balance board, or medicine ball. Stork Turns: From a standing position, lift your left leg and lock your foot behind your right knee; rotate your hips back and forth while keeping your shoulders from rotating and maintaining balance. Repeat on the right leg, 15 turns for each leg, for better balance in your swing. Cats and Dogs: Start on hands and knees. Without bending your elbows, lift your head and lower your spine as far as possible, stretching into a dog position. Then, lower your head and lift your spine as far as possible, creating the cat position. Repeat back and forth for two sets, 30 seconds each, for better range of motion. Forget those high-tech drivers and pricey putters. The message to golfers this season is to invest in your body, the most important piece of equipment of all. Four Seasons Resort and Club Dallas at Las Colinas is in Irving, Texas, 10 minutes from Dallas-Fort Worth International Airport. A golf-fitness assessment with Brad Davis and Rod Cook is $250. The resort’s TPC golf course hosts the annual HD Byron Nelson Championship, May 18-24. Information: fourseasons.com/dallas. Through May 15, Susan Tait offers 20-percent off her basic Body Driver golf assessment and 10-session training package at Fitness Success in Ann Arbor. Information: bodydriverbyfitnesssuccess.com. Sign up for free access to the Titleist Performance Institute at myTPI.com.